Brian Carter is an “all rolled into one” drummer/percussionist, drum circle facilitator and music teacher, that's been performing and teaching for 25 years. He is the C.D.O. 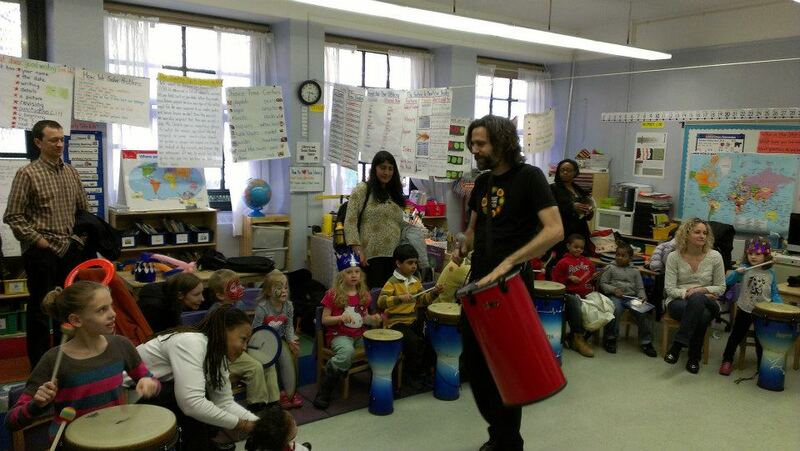 (Chief Drumming Officer) of Brooklyn Drum Circles, offering Community, Recreational, Wellness and Team Building circles in New York City and the surrounding areas. His mission is empowering people to be present, joyful, and confident, therefore leading happy and productive lives. Brian's services have been used by Bloomberg, VH-1 Save the Music, and NAMM to name a few. He has taught music to all grades in the NYC Public School system for over 20 years as a Classroom and Instrumental Music Teacher. Brian is also a trained REMO Health Rhythms Facilitator, a wellness-based protocol developed by the biggest drum company in the world, The protocol, which has research based results, is widely used in hospitals, senior centers, and wherever healing is an intention. He's received training from Christine Stevens and Arthur Hull, two of the biggest names in Drum Circle Facilitation. As an accomplished performing musician of over 25 years, he has toured nationally with the renowned Middle Eastern rock group, Raquy and The Cavemen (http://raquyandthecavemen.com/home.html), with whom he played dumbek and riq. He has also played on the album “The Middle East Side” with the band Djinn (http://djinnnyc.com/), who are known for their unique and eclectic style. His easy-going nature has also made Brian a favorite among the NYC Middle Eastern dance community, with whom he plays at all sorts of diverse engagements. He's performed at a wealth of NYC venues including DROM, Irving Plaza and The Alvin Ailey Dance Center. Brian is also an accomplished drum set artist. He is a member of the the "KidDult" band, The FunkeyMonkeys (http://funkeymonkeys.com/). Their show is part theatre, part multi-genre music, and it incorporates funny sketches and improvised bits -- along with their unique brand of truly funky, heartfelt, quirky, and always fun kid's music. He's also the drummer with WorldJamRoots band, Sidecar Agogo (http://www.reverbnation.com/sidecaragogo). You can find out more about Brian through the links below.